The research of the international artist Carsten Nicolai aka Noto, in his performance at the Guggenheim in New York last January, had the aesthetic quality and infinitely indented edge of a fractal object. The artist reveals the density of Contemporary environment focusing on sounds emitted by faxes, telephones and modems; the primary vectors of modern communication. With a background in landscape designing, Noto has instilled into vanguard electronic music a geometric concept of sound; the artist looks at the materiality and form of sound wave’s, at its structure and tries to identify and substitute the concept of silence with that of empty space. With his ensemble of oscillographs, DAT recorders and mixers, Noto proceeds with the agility of a ropedancer into the frontier that joins and disjoins the perceived universe between that of sound and the visual, arranging his works in the interface between sound and vision. In the sound architecture like his sculptures, paintings and installations, the artist puts antithetical factors at the base of the generative process, and he combines them in a hypothesis of synthesis that has the complicated faceted morphology of crystals. Like a particle around which forms a snow flake crystals and is responsible for engendering unique and unrepeatable forms, in the same way the Nicolai’s works moves from a geometric dimension point of 0: a sound sample that constitutes the nucleus around which is created a system of omotetic objects organized by the artist in loops. To escape from the system, Noto admits to mistakes, a variation in sound, which provokes an unexpected change in the sound and frequency, breaking up the omotetia and thus creating another nucleus, a new systemic departure. 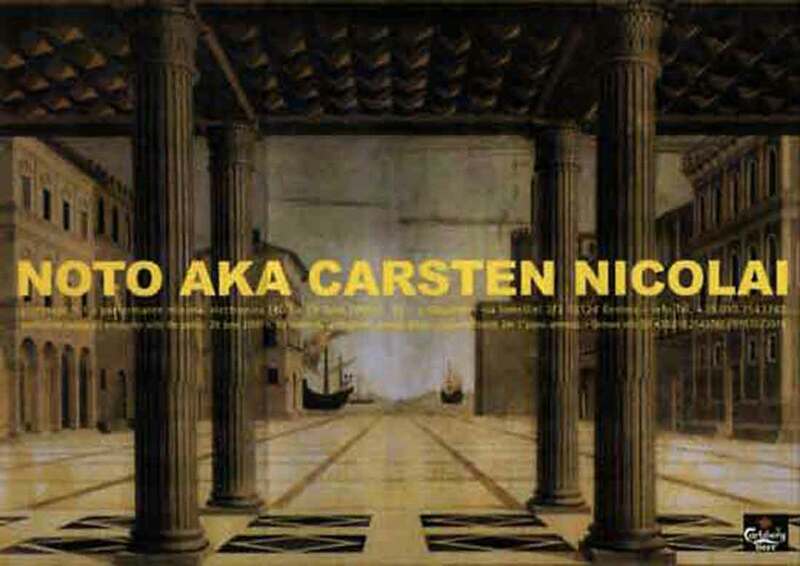 Emblematic of the project that Noto developed in ’97 for Documenta X (Kassel), titled with the symbol of infinity, Nicolai has occasionally collaborated with other sound researchers. The project 20 to 2000 brought to realization a series of cd with the most interesting musicians in the field of electronic music, like Mika Vainio (Pan Sonic), the Japanese DJ Ryoji Ikeda, as well as Byetone. Recently at the Hayward Gallery in London, Carsten Nicolai was presented in the show Sonic Boom by a collective matrix sound work. Nicolai is a traditional artist who proposed to put himself out of the post-Modern concept of representation: “We can say that everything exists, it only needs to be sampled, but that isn’t my work, I have always believed in the possibility of making something of new”. The Contemporary art gallery, Pinksummer, has chosen, Noto aka Carsten Nicolai, looking at the wonderful minimal forms of sounds dispensed by the artist in the space with a similar way of the matter distributed in the universe.